This story gets more bizarre by the moment. 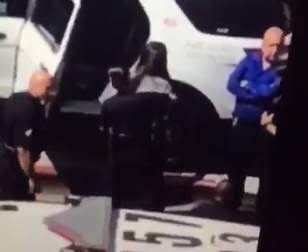 Cell phone footage captured a USC professor reportedly being arrested for making students call in a fake active shooter.
.@USCDPS confirms that a detention was made on-scene for the mental health evaluation of an adjunct professor. No other info released. A USC professor suffered “some sort of an episode” that caused students to believe there was an active shooter at school, triggering the campus scare and police response on Monday, police said. The search netted no evidence of a shooting or a shooter at school, authorities said. An all-clear was subsequently declared. Tingirides said the professor was in LAPD custody. Early reports have emerged that an active shooter has opened fire at USC. Police have placed the area on lockdown. The LAPD are now reporting no active shooter is present. NBC4 is working to confirm additional details. Below is a periscope of the incident.